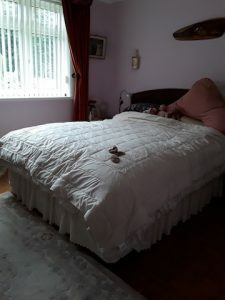 A warm and friendly elderly person is offering a double bedroom and shared use of the home’s facilities exchange for about 10 hours a week of practical help plus 5 hours additional companionship (or similar combination of the two). This opportunity would suit someone who works or studies in the day and would be able to give support and companionship in the evenings and at weekends. The person would appreciate the security of someone sleeping in the house at night, some friendly companionship and generally helping around the house with some light cleaning, a little shopping, occasional cooking/sharing some meals and perhaps short local outings. You would be required to keep your own room clean and tidy and keep the kitchen and bathroom clean after use. British/Indian, this person is very switched-on and would like this support to help her live her life. They enjoy reading the newspaper, playing Bridge, going for short walks, and watching TV (crime dramas, soaps etc). There is a garden. This is a smoke free, pet free home. The property is conveniently located in Southampton just three miles from the city centre, very close to Southampton University Highfield Campus and Southampton General Hospital, and ¼ mile from bus stops. £125 + 20% VAT per month [Total £150 per month]. Plus possible contribution to Council Tax (£25 per month). NB Full-time students are exempt from Council Tax.